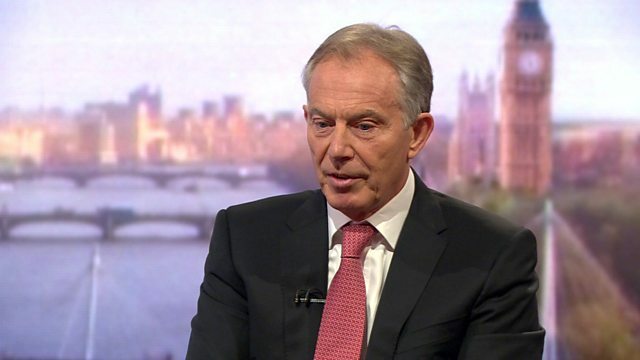 The former Labour Prime Minister, Tony Blair, has said leaving the EU would create "an enormous economic problem". Speaking to Andrew Marr, Mr Blair said "if we vote to leave we will suffer an immediate shock to our economy" and "years of uncertainty". He said this was not a hypothetical risk but "something you will see directly in people's jobs and living standards" and the confidence of business to trade. On immigration, Mr Blair said he accepted it was "a big issue" but that it was "not going to be solved by leaving the EU". He added that some of the people who come here from Europe "play a fundamental part in services like the NHS" and that free movement of people also applies to British people going to Europe.